The Table Tower is filled by allowing wine to pass through the ""rain filter"" which aerates the wine releasing the bouquet on it's way into the decanting vessel beneath. Now your guests can simply help themselves. With a little lift of the specially designed stainless steel gravity fed valve, a glass of wine is served within seconds. An elegant way to serve all kinds of wine, an eye catching table top conversation piece, sure to be a hit while entertaining at home. Use it for aerating and serving your favorite wines. Made of durable borosilicate glass, stainless steel, silicone and a slate base with EVA bottom. Easy to clean, simple rinse the funnel and decanting vessel. Designed by Vagnbys award winning design team in Copenhagen, Denmark. I broke the filter glass on the top how i can replace it, where i can by it? BEST ANSWER: The Table Tower Aerating Wine Dispenser parts should be available through the manufacturer. The link is as follows: https://www.vagnbys.com/table-tower. How does the wine dispense from the glass container? I don’t see a lever. BEST ANSWER: The Table Tower Aerating Wine Dispenser has a dispenser which you push up a little to serve and release to stop the wine. I was lucky enough to receive a Table Tower as a recent birthday git and I can honestly say it is the best wine gift I have ever been fortunate to receive. 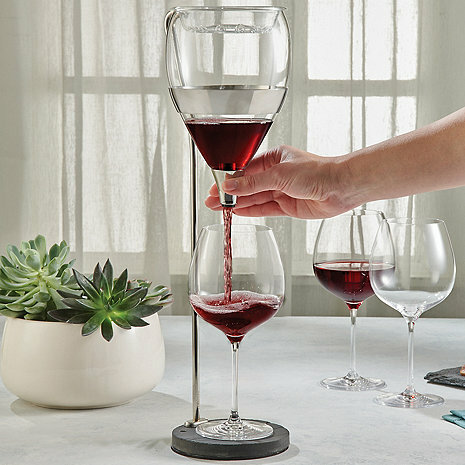 Holds a full bottle of wine and aerates and serves a glass effortlessly. Received a lot of complementary comments about it's appearance from dinner guests. Absolutely love it! And every person that sees it wants one. Purchased this as a gift for my husband for Christmas. It leaked the first time we used it. Took it apart cleaned it and tried again with the same results. Exchanged it for another and the second one leaked. So disappointed. I returned this item and have yet to receive a credit for it. This is after three weeks and at least four messages to Wine Enthusiast. Very disappointed. Bet this doesn't make the list. We LOVE our wine dispenser! It's such a nice / different to aerate our wine! Decorates our table nicely!